The Warrumbungle National Park is one of the most diverse national parks in Australia with a never ending amount of beautiful walks for bushwalkers plus stunning landscapes (and inky black nightscapes) for photographers. Carved out of rugged grazing country in 1953 and inscribed on the National Heritage List in 2006, Warrumbungle National Park is a visual feast with highlights that include towering volcanic features and myriad wildflowers that colour the landscape in spring. Since the 1930s it has been known as one of the state's best bushwalking destinations and some 30km of tracks scramble up, around and over the striking natural formations. The best walks among them are Belougery Split Rock, Macha Tor and the iconic Grand High Tops, all of which offer glorious views and take hikers past grazing kangaroos and woodlands alive with eastern spinebills, honeyeaters, currawongs, wattlebirds and the flashes of firetails. This image belongs to the travel and nature stock photo library. This stock photo of The Breadknife and Warrumbungles at Sunrise is available for licensing for commercial and editorial uses including websites, blogs, books, magazines, brochures and advertising. Restrictions may apply for images which contain third party copyrighted material or sensitive subjects. Photos of artwork are for editorial use only. 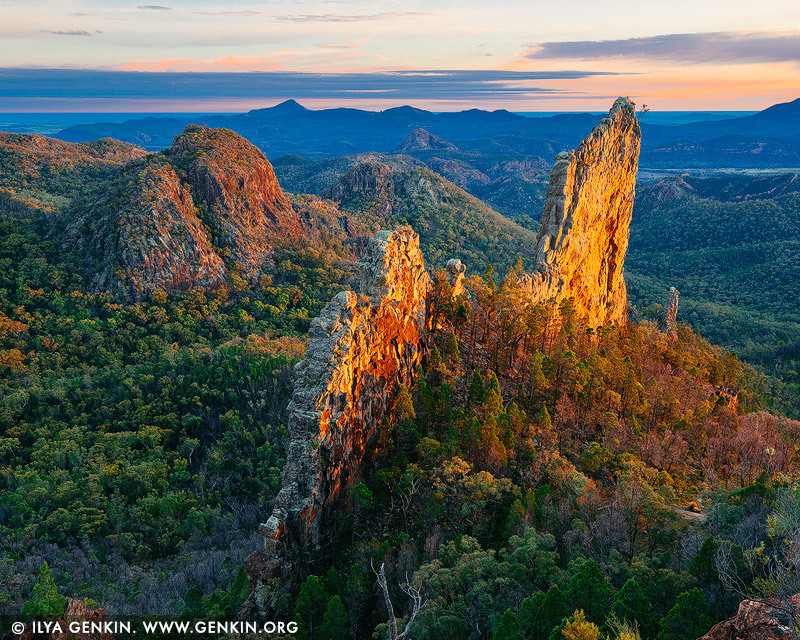 This image id AU-WARRUMBUNGLES-0004 of The Breadknife and Warrumbungles at Sunrise, is copyrighted © by Ilya Genkin. This is not a public domain image.